Wheelchair access area has space for 4 wheelchairs and 4 attendants. Centennial Theatre reserves 8 House Seats per performance. A 4-hour Front of House staff call is included for all performances. The Lobby includes a licenced concession operated exclusively by theatre staff. The Lobby can accommodate ten (10) five foot tables. Lobby sales for programs, cds, memorabilia, etc. can be arranged through the Front of House Supervisor. Merchandise is subject to a 10% lobby sales commission. If the Centennial Box Office is providing ticketing services, Box Office staff will be available for a 2-hour performance call to facilitate ticket sales at the door and Will Call. 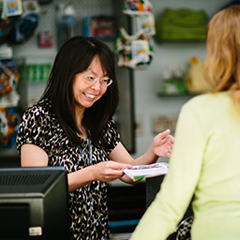 Advance ticket sales services are available online and through our in-house Box Office. Visa, Mastercard and American Express are accepted. The ticket printing and/or commission cost is added to the price of the theatre rental. Catering is permitted in the lobby subject to compliance with health regulations required by Vancouver Coastal Health. Ample and free parking is available in the lot adjacent to the theatre. The theatre is wheelchair accessible to the main house, stage, dressing rooms and washrooms. The theatre is equipped with a Listen Technologies hearing assist system available through the concession. Centennial Theatre is located in North Vancouver, one block south of Highway 1 (Upper Levels Highway) at the N.E. corner of Lonsdale Avenue and 23rd Street, 23 blocks north of the Lonsdale Quay.